If it was air-cooled and rear engined, why'd they bother putting the hood there? The one in the video didn't have the faux hood, either. Guessing it looked "normal" with the hood. Probably sealed a bit for storage or maybe the fuel tank was there. Looks like the answer was right in the article: The hood and space under the front seat are for storage. Based on the picture of the frame, it looks like the gas tank was under the passenger side floorboard. I wonder if that made the car lean to one side or the other depending on whether the tank was full? The car should corner very level with a rotary engine in a horizontal position. I had a rotary engine in a snowmobile once, That was the smoothest engine I ever had. You couldnt even feel it running. Gotta wonder what happens when you hit an abrupt incline? Gyroscopic precession would make it lean to one side. Wonder if it is noticeable? 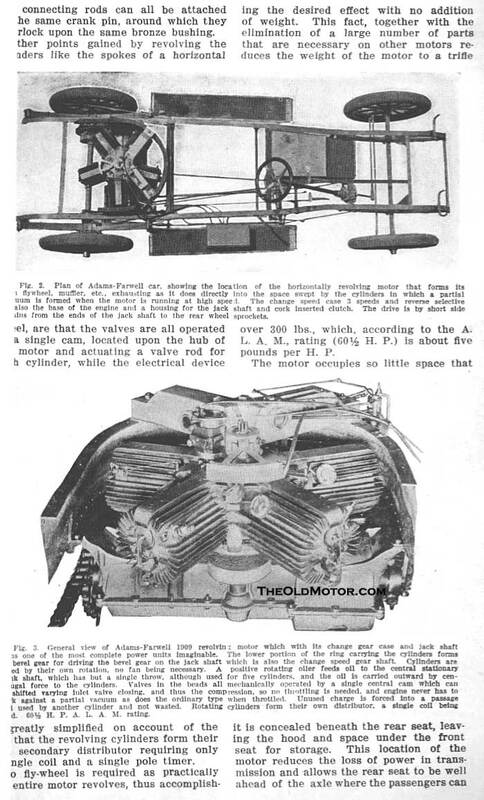 Here is one of the other of the three pages we have posted from an article in the Cycle and Automobile Trade Journal of September, 1908. This shows more interesting details of the engine, clutch and transmission. Anyone care to speculate why it (And all single row four stroke radials) have an odd number of cylinders. You pilots out there hold off until others have had a chance. There is nearly always an odd number of cylinders in a single row rotary, as this helps with harmonic vibration, and even number will be more inclined to develop vibration problems. Propellers are the same, a two blade prop s most common because they are easier to manufacture, but a three blade prop will run a lot smoother. It would take a rather radical bump in the road to cause any adverse movement from the gyroscopic effect of the engine, but if you did a Thelma and Louise with it, it would probably roll a half turn. Why does a Radial Engine always have an odd number of cylinders ? Any four stroke engine, regardless of construction, must fire all of the cylinders in two revolutions of the crankshaft. Unlike an automobile engine, a radial engine has only one crankshaft throw for all the cylinders in a bank. Remember that an 18 cylinder engine is just two 9 cylinder banks, set 180 degrees to each other. The firing order starts with the #1 cylinder at the top and proceeds around the engine in a counter clockwise direction as viewed from the front. The firing order progresses from the #1 cylinder, skips #2 cylinder and fires #3 cylinder. So in the first revolution of the crank, the firing order would be #1, #3, #5, #7 and #9. Using this skip and fire technique, the next cylinder to skip on the second revolution of the crankshaft, would be the #1 cylinder. On the second revolution of the crank, the firing order would be #2, #4, #6, #8. Again using the skip and fire technique, the #9 cylinder is skipped and the #1 cylinder is again ready to start the whole process over again. If there were an even number of cylinders, half would never be fired. I love to learn something I never thought about before! Thank you all. I had not thought about the ignition sequence on a 4 cycle radial, a lot of the early rotaries were 2 cycle. The harmonic vibration is not a factor in the radial engines that it is in the rotary engines. Interesting that they control the speed by how much the intake valve is allowed to open. 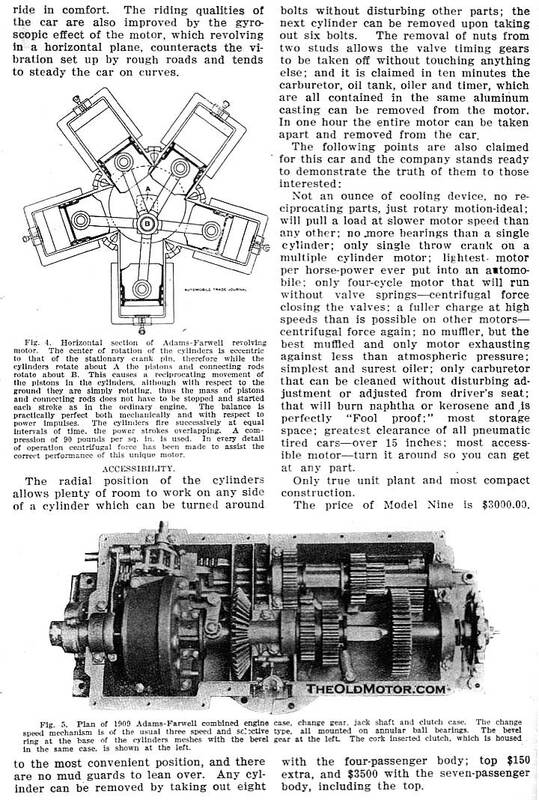 Rotaries were uses on a lot of WW1-era airplanes. Those mostly had no throttling. The only control was a switch to shut off the ignition. Pilot would blip it on and off to control power when landing. The more "advanced" planes had a mode that would fire something like every other cylinder. Pretty interesting sound if you ever see those planes fly. The ad here also talks about how the oil moves from a central gallery out to the cylinders through centrifugal force. No mention of how it moves back. Total loss oiling? Someone mentioned a rotary in a snowmobile. That would be a Wankel, and is something completely different. I overhauled one of those once for my son's RX7. Very interesting!